Head Injury Category Archives — Massachusetts Injury Lawyer Blog Published by Boston, Massachusetts Injury Attorneys — Breakstone, White & Gluck, P.C. Should students have to wait until they finish 7th grade to play football in Massachusetts? Lawmakers are being asked to consider legislation to delay the start of play to protect players from concussions. Children would be allowed to play flag football or any form of football which does not involve tackle play. The proposal does not include any other sport. The Centers for Disease Control and Prevention (CDC) define a traumatic brain injury (TBI) as a disruption to the brain caused by a blow or jolt to the head. Concussions are considered a mild TBI, which can result in a brief change of mental alertness or consciousness. A severe TBI can result in a longer period of unconsciousness or mental change. Symptoms may not be immediately evident after a concussion, especially if the person or those around them are not familiar with the symptoms, which can include an inability to think clearly, memory problems, feeling dazed and mood, behavior or personality changes. Headaches, nausea and vomiting can also set in. Beyond the sports field, falls are the leading cause of concussions, according to the CDC. Adults over age 65 and children under 14 are most likely to suffer a fall leading to a head injury. Car crashes are the third leading cause of concussions, followed by being struck in the head by an unspecified object, such as in a construction site accident or by violence. Concussions can also happen on the sports field. Not every contact necessarily results in a concussion, but to identify injuries, Massachusetts and other states have already passed concussion education and training laws. Known as “return to play” laws, these require high school and middle school students to be examined by a medical professional before they can participate in sports again. New research shows there is a measurable impact when younger children play football. In a study of 26 football players – all age 12 – Wake Forest researchers found changes in the corpus callosum, which joins the two sides of the brain and integrates cognitive, motor and sensory functions. The players underwent MRIs to examine the changes prior to the three-month season and three months after the season concluded. They were compared to 22 other students who did not participate in contact sports. Players who suffer a concussion need proper rest and treatment so they can properly heal and to reduce the chance for another injury. Researchers have documented this risk; one study found high school and college students who sustained concussions were four to six times more likely to suffer a second injury (Source: McGill University in Montreal). Lawmakers in Massachusetts and five other states have proposed banning tackle football for children younger than 12 or for those in seventh grade or younger. Data from Shape America. Massachusetts isn’t taking the field alone on concussions. 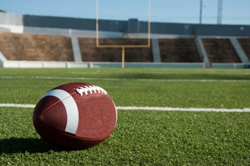 At least five other states are also debating tackle football bans for children under age 12. 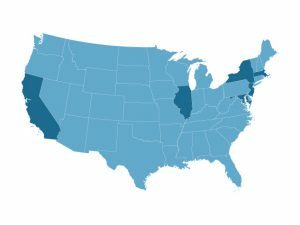 These states include Illinois, California, Maryland, New York and New Jersey, according to Boston.com. But none of the proposals are on track to reach state governors. All 50 states already have “return to play” laws aimed at reducing youth sports-related concussions, according to the National Conference of State Legislatures. Washington state was the first to pass such a law in 2009. By 2015, every other state had enacted a similar law. In most states, these laws mandate concussion awareness training and education to prevent concussions among student athletes. According to Shape America, 48 states require students suspected of having concussions to sit out at least 24 hours. Arizona and South Carolina allow students back on the field the same day with a doctor’s approval. Passed in July 2010, the Massachusetts concussion law requires parents, volunteers, coaches and school nurses to receive specialized concussion awareness training. This is to help them recognize concussion symptoms and help students receive treatment as soon as possible. As in other states, the Massachusetts law requires medical clearance before students can return to sports. Schools are then required to maintain detailed record-keeping related to a student’s injury and progress in the classroom and on the field. The law is M.G.L. ch.111 §222. The Code of Massachusetts Regulations is 105 CMR 201.000. All middle and high schools which offer sports through the Massachusetts Interscholastic Athletic Association (MIAA) must follow the concussion safety law. Attorney David W. White with members of the Quincy Police Department Bike Patrol: Officer White, Officer Whedbee and Lieutenant Bina. Attorney David W. White and Lieutenant Bina of the Quincy Police Department. As part of our Project KidSafe campaign, Breakstone, White & Gluck was pleased to make a donation of 200 bicycle helmets to the Quincy Police Department this year. 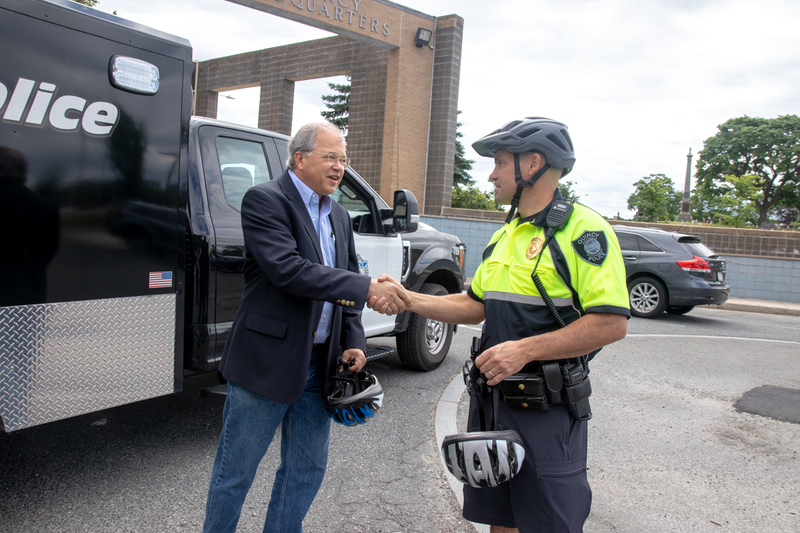 Attorney David W. White visited Quincy Police Department headquarters on June 14th and had a nice opportunity to speak to members of the Quincy Police bike patrol. Professional football players face a high risk for concussions, far greater than most of us. But Rob Gronkowski’s concussion a few weeks ago was a reminder that concussions can happen when we least expect them, even in the middle of a big game. And when they do, the game must stop. Much has changed over the past decade, as hundreds of former NFL players have sued over head injuries. Every state now has a concussion protocol for student athletes. In Massachusetts, students, coaches and parents are now trained to recognize concussion symptoms and how to respond. But others should also be aware of the risks. Beyond the playing field, concussions can happen in car accidents, construction accidents, falls and other situations. Concussions are a mild Traumatic Brain Injury (TBI) which are often caused by an impact to the head. Concussions can be hard to recognize at first, with some initial symptoms mirroring the flu. As we continue our 2017 Project KidSafe campaign, Breakstone, White & Gluck wants to share a few recent bike helmet donations and some bicycle safety tips for children over the Memorial Day weekend. Breakstone, White & Gluck was pleased to donate 100 bicycle helmets to the Norwood Police Department for the third year. Attorney David W. White delivered the helmets to Norwood Police Chief William G. Brooks III in early May. 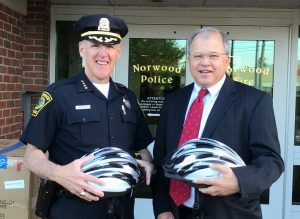 The Norwood Police Department now plans to distribute the helmets at a bike safety event being planned for June. If you live in Norwood, watch local community calendars. It was also our pleasure to donate 170 bicycle helmets to Bikes Not Bombs in Jamaica Plain. Founded in 1984, Bikes Not Bombs works to repair used bikes locally and internationally to help individuals. This was the fifth year we have made this donation. In Boston, Bikes Not Bombs offers a popular Earn-A-Bike program, which teaches children and teenagers how to ride in the city and repair bikes during a six-week session. Students are taken on group rides and get to help refurbish a bike to take home. Each graduate also takes home a new bicycle helmet from our Project KidSafe campaign. 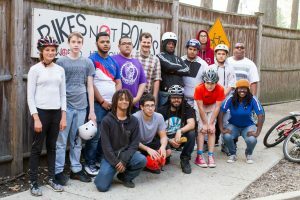 In addition to Earn-A-Bike, Bikes Not Bombs offers other programs for teenagers in the Boston area, aimed at helping them learn safe cycling skills and bike repair. These programs include Girls in Action and BOCA, a program which combines cycling and community action. You may see a Bikes Not Bombs tent at local community events this Spring and Summer. The organization collects and rehabs bikes for people without access to transportation in Africa, Latin America and Caribbean. Bicycles provide a means of transportation and help individuals fight political oppression and rebuild communities. If you have an extra bike, consider making a donation. Learn more on the Bikes Not Bombs website. Graduates of Bikes Not Bombs’ Earn-A-Bike program in April 2017. Breakstone, White & Gluck was pleased to donate new bike helmets. Through our Project KidSafe campaign, Breakstone, White & Gluck has donated over 10,000 bicycle helmets to children in the Boston area since 2013. During the fifth year of our campaign, our goal continues to be to encourage children to wear a helmet every time they ride. Study after study has shown wearing a helmet is the most effective way to protect you or your child from a head injury if you fall or are in a bicycle accident. Yet studies also show children are not always wearing helmets, even though many states have laws requiring helmet use for children. In Massachusetts, the law says children who are 16 years old and younger must wear helmets. Earlier this month, the Today Show reported more than 400,000 kids are hurt each year while riding bikes, scooters, skateboards and skates or roller blades. Of the children injured on bikes, only 68 percent were wearing bike helmets, according to their parents. Wear a bicycle helmet. Select a helmet for your child which meets the Consumer Product Safety Commission standard. Properly adjust it so it has a snug fit and will provide protection in case of a fall or a bicycle accident. If you need help, there is an instructional video on our website. Then, tell your child it is important to wear a helmet every time they ride. Be sure to wear your helmet, too. These last two steps are the most important. Wear neon and bright colors. Stock your child’s drawers up with neon t-shirts and other clothing. You want to help your child stand out to traffic, pedestrians and other cyclists. Search “neon clothing” on Amazon.com for ideas. Ride with your children. Enjoy cycling with your children and teach them safe riding techniques at the same time. Control your bicycle. Keep both hands on your handlebars and tell your child to do the same. Keep school backpacks light or use a bike basket. Encourage children to always look ahead and not turn around to talk to you or other cyclists while pedaling. No cell phone use. Do not let your child ride with their cell phone. If they must, make sure it is packed away in a backpack and turned off. Cell phone use is likely to lead to a bicycle accident. Check equipment. Before they ride, check your child’s bike. Make sure tires are properly inflated and that the brakes work. Avoid riding at night. Children should not ride at night until they are older and have more experience on the roads. If you ride at night, be aware that you are required to use lights and reflectors under Massachusetts law. 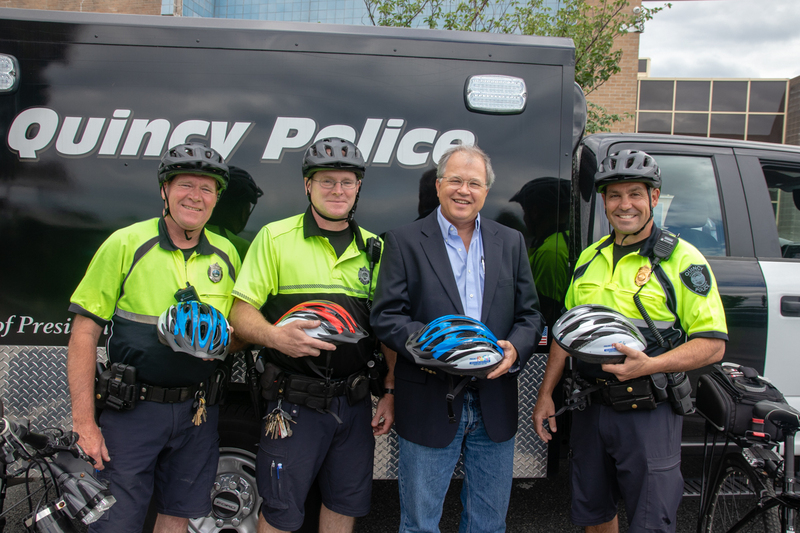 Breakstone, White & Gluck was pleased to donate 120 children’s bicycle helmets to the Dedham Police Department and the Dedham Bike Rodeo this year. This was our fourth year participating in the rodeo and Attorney Reza Breakstone was on hand to fit children for new helmets and answer questions about bicycle safety. The Dedham Police Department and the Dedham Parks & Recreation Department organize the annual rodeo, which is always held at the Endicott Estate. We always expect warm weather, but this year was especially hot and we were worried children may not come out. There was no cause for concern. We still had many parents and grandparents bring children, and children from local childcare programs stop in. Attorney Breakstone still fit about 75 children ages 4 to 10 for new bicycle helmets. Dedham police officers will give the rest to children who need one. Breakstone, White & Gluck donated the bicycle helmets through our Project KidSafe campaign, which has now donated over 10,000 helmets to children in eastern Massachusetts. We started our safety campaign in 2013. The Dedham Bike Rodeo was one of our first events and it is always rewarding to return each year. 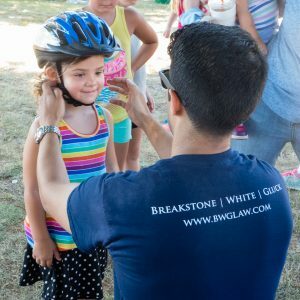 With a donation from Breakstone, White & Gluck, Norwood Police distributed free bicycle helmets to children who needed one at Norwood Bike Safety Day over the weekend. Attorney David W. White with Norwood Police Chief William G. Brooks III and Officer Paul Murphy. Photo courtesy: @ChiefBrooksNPD. This is the second year Breakstone, White & Gluck has donated helmets for distribution on Bike Safety Day, which was held at the Balch Elementary School. 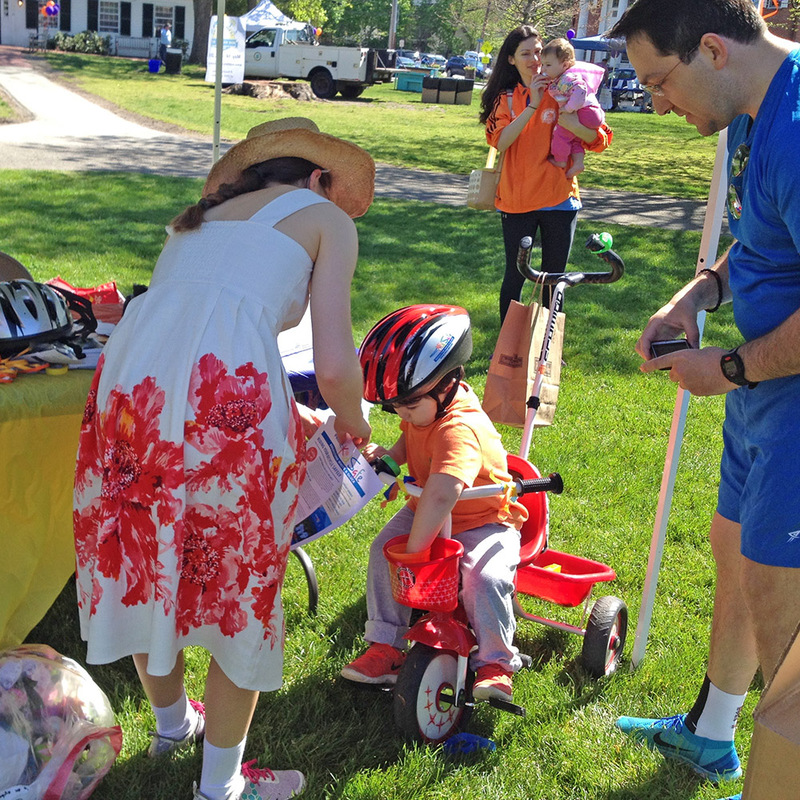 Bike Safety Day was organized by the Norwood Police Department and the Norwood Bike Depot, a local bicycle shop. Norwood Police school resource officers and the Mountain Bicycle Unit were out to meet the community. 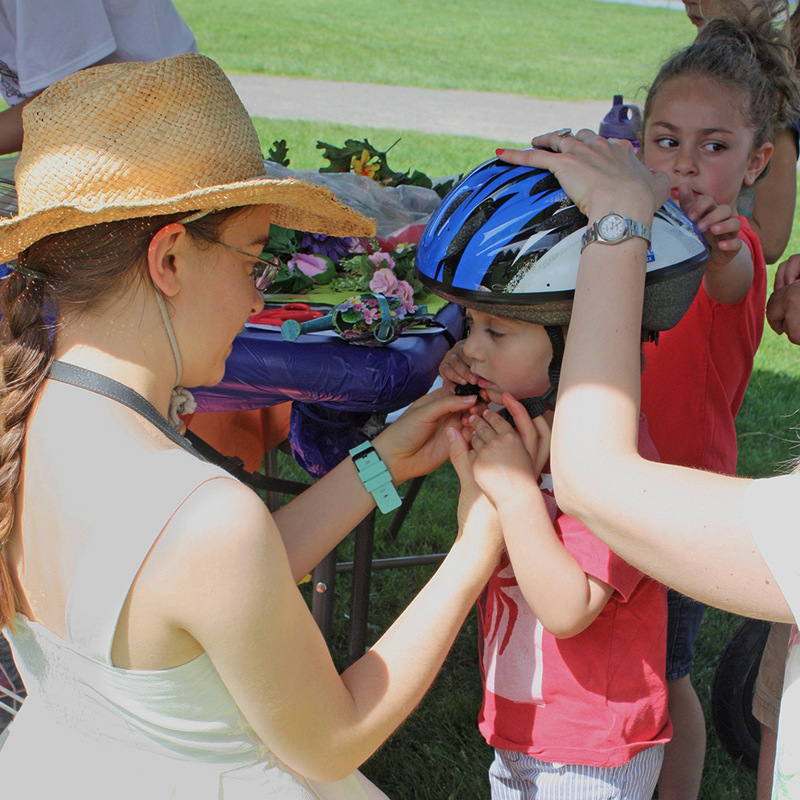 Cyclists of all ages came out strong for Lexington’s Bike Walk ‘n Bus Week in May. Breakstone, White & Gluck was pleased to donate bicycle helmets to children who needed one at events such as the Bike Smart Class for fourth- and fifth-graders and the Bike Art Contest. With each helmet given, children and parents were shown how to properly fit them on their own. We are also happy to see these two little cyclists stopped by for a Project KidSafe helmet. Thanks ArtsOffRoad Lexington for sending along the photos. Bike Walk ‘n Bus Week was held from May 14-22 and coincided with Bay State Bike Week. While the rest of the state celebrated cycling, Lexington focused on bicycling, walking and encouraging use of alternate transportation, such as buses. The organizers were the Lexington Bicycle Advisory Committee, Greenways Corridor and Massachusetts Safe Routes to School. Events included breakfasts, bike rides, a bike parade and bike maintenance workshops. There are two active committees representing cyclists in Lexington: the Lexington Bicycle Advisory Committee and the Friends of Lexington Bikeways, which coordinated the bicycle helmet donation from Breakstone, White & Gluck. Because of their work and the strong local interest in cycling, Lexington was named a bronze level Bicycle Friendly Community by the League of American Cyclists in 2015. Breakstone, White & Gluck donated 140 bicycle helmets in Lexington this Spring. It is the third year we have made a donation and it is nice to see the community’s interest. 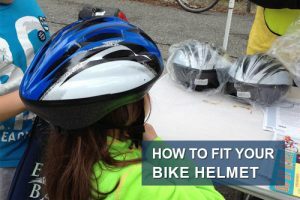 In addition to Bike Walk ‘n Bus Walk Week, Lexington Police gave out bike helmets at Discovery Day on May 28th and showed children and families how to properly fit them. Breakstone, White & Gluck donated the bicycle helmets as part of our Project KidSafe campaign. Since 2013, we have donated more than 10,000 bicycle helmets to help children prevent head injuries and ride their bicycles safely. Read about our past events and donations here. Visit this page to view bicycle safety resources. These are the days when children just want to be outdoors, riding their bikes. We want them to enjoy the experience and always, always wear a bicycle helmet. 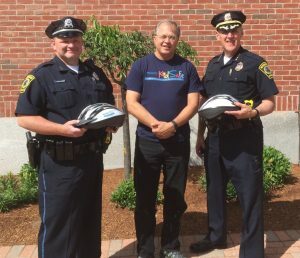 Breakstone, White & Gluck recently made bicycle helmet donations in Westborough, Lexington and Dorchester as part of our Project KidSafe campaign. We are committed to protecting young cyclists and are now in the fourth year of our campaign. Along the way, we have donated over 10,000 bicycle helmets to children who need one, with support from community groups, bicycle safety organizations, police departments and schools which organize bike helmet giveaways. Wearing a properly fitted bicycle helmet is the best way for cyclists to protect themselves against head injuries from falls and bicycle accidents. Under the law, anyone who is 16 years of age or younger in Massachusetts is required to wear one while riding. Welcome back cyclists! Bay State Bike Week is here and many of you are commuting to work for competition, attending commuter breakfasts, and participating in events to make this work week pass a little faster. The goals are to help protect the environment, reduce traffic congestion, get a little exercise, and have fun with other cyclists. 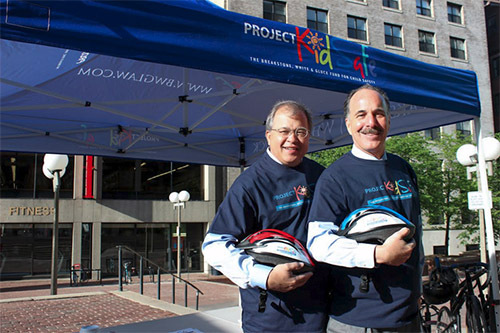 Attorney David White and Marc Breakstone on Boston City Hall Plaza with our Project KidSafe tent and Project KidSafe helmets during Bay State Bike Week 2015. The event was Bike Friday and it was organized by Boston Bikes. Breakstone, White & Gluck is pleased to participate as well. On Friday morning, we will join cyclists at the Bike to Work Day event on Boston City Hall Plaza. If you attend, please stop by our Project KidSafe tent and say hello to some of our lawyers! Boston Bikes is organizing the event. 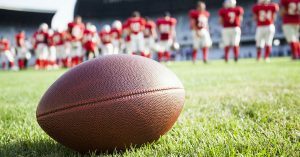 Last summer, the National Football League (NFL) announced it had reached a $765 million settlement with retired players who suffered from concussions and head injuries. But a federal judge has rejected the settlement and the debate about how to address the risk continues. Even President Barack Obama has spoken: “I would not let my son play pro football,” he told The New Yorker magazine. But like many of us, he is a fan; he made the statement while watching the Miami Dolphins play the Carolina Panthers. Some 41 percent thought the NFL has taken meaningful action to reduce and prevent concussions; 20 percent disagreed. Roughly half of those surveyed with an annual salary of $75,000 or more said they would encourage their child to play another sport. On the other hand, only about 25 percent of those who earned $30,000 or less per would try to steer their child to another sport. One third of those who did not attend college said they would encourage their children not to play football, compared to 42 percent of college graduates and 57 percent of people with post-graduate degrees. The NBC News/Wall Street Journal poll included 800 adults and had a margin of error plus or minus 3.46 percentage points. The NFL released figures in January showing the number of player concussions dropped 13 percent from 2012 to 2013. It has taken several steps to prevent concussions, including adding neurological consultants to the sidelines and replacing equipment. But another notable part of the debate came from a recent NFL Nation survey of 320 players, just prior to the Super Bowl. The survey reported 85 percent would play in a Super Bowl with a concussion. More than 4,500 retired players have filed concussion-related lawsuits against the NFL. The settlement must cover over 20,000 retired players for 65 years. The players accuse the league of long concealing the long-term risk of concussions from players, coaches and trainers. If an athlete suffers multiple concussions, it can lead to chronic traumatic encephalopathy (CTE), a progressive degenerate disease of the brain which is associated with memory loss, depression, paranoia, confusion and dementia. Going the Distance, The New Yorker. Poll Finds 40 Percent Would Sway Children Away from Football, Wall Street Journal.